Another weekend and another offside call that confused the Premier League officials, although for Raheem Sterling this one turned into the first of three goals for a player having the season of his life. Manchester City extend their lead at the top of the Premier League, to a four-point margin for the first time this campaign, and the challenge is for Liverpool to match them against Burnley today. Yet the breakthrough for Pep Guardiola's side did not arrive until the minute following half-time, frustrated in the first half by a stubborn Watford performance that was eventually broken by a goal that should have been ruled out. 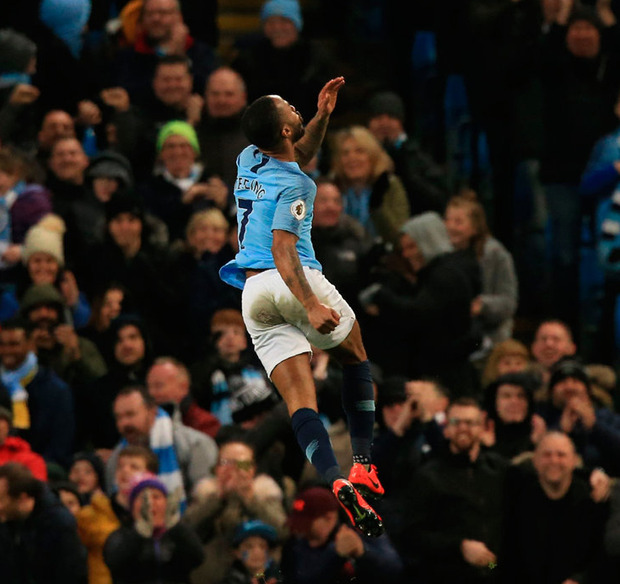 Sterling was in an offside position when the ball was chested through to him by Sergio Aguero and as the striker moved to strike with his right foot, a challenge from Daryl Janmaat meant the ball cannoned against his left leg and past goalkeeper Ben Foster. It was an offside call similar to the one for Harry Kane's penalty against Arsenal the previous Saturday, but on this occasion the difference was proximity. For Watford, who would later strike back through Gerard Deulofeu, it was difficult to take and they collapsed with two more goals before the hour. 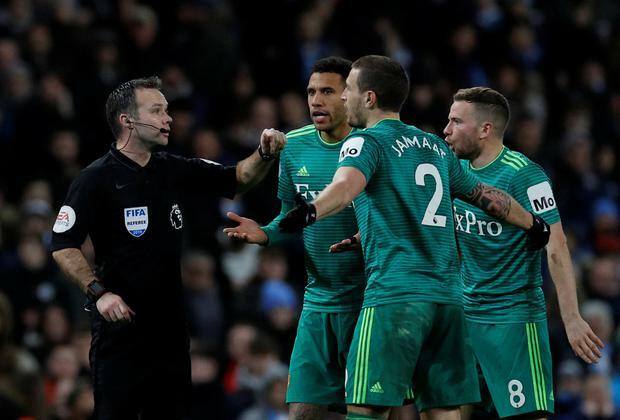 Javi Gracia had made seven changes from the team that dispatched Leicester City the previous weekend and whatever it was the Watford manager was trying to do in the first half, it certainly worked for his team. They did not have a single attempt on Ederson's goal before the break, either on target or off. Yet Gracia seemed to have anticipated City's system accurately - just two changes from the win over Bournemouth - and he was happy to keep forcing them wide as they probed for an opening. The two Silvas, Bernardo and David, tucked in either side of Sergio Aguero and those two creative attackers were marked tightly by Tom Cleverley and Abdoulaye Doucoure. That meant the ball often was funnelled right to Riyad Mahrez or left to Sterling, from where Watford were better placed to cope. The ball crossed into the area they could handle, with the height advantage of Miguel Britos and Christian Kabasele. Britos gave the ball away once in a dangerous position and Watford escaped with a corner. Another time they unwisely left Aguero unmarked at the back post and he headed wide. But generally there were few errors and when Sterling did get free, Janmaat launched a masterful saving tackle. Naturally, City dominated possession, but not to the extent in the first half of their display against Bournemouth. What they did with the ball amounted to very little before the interval. Watford conceded at the end of the first half in their home fixture against City this season and, eventually two goals behind, they rallied well in the closing stages. This time their concentration had been better. The away side were just a minute into the second half when the contentious first Sterling goal was scored, a decision that not even a touchline conversation between referee Paul Tierney and his assistant could satisfactorily resolve. Before the hour, Sterling would have his hat-trick and Watford's plan to contain and repel was in ruins. Janmaat's challenge played the ball against the left leg of Sterling and the ricochet beat Foster. Sterling's second came moments after Tierney and Holmes had come to their decision, the ball cut back by Mahrez to his fellow winger, away from goal, and tucked in from a yard. Sterling was in an offside position but because the ball was not played forward, there was no offence. The third was the best, a ball in behind Janmaat, a run back across the box past Kabasele and then a finish past Foster. The winger was off just after the hour, his job done with 15 league goals for the season. Watford's goal came with the first two touches of their two substitutes, introduced after 65 minutes. Troy Deeney's flick was finished well by Deulofeu and from then on Watford challenged City more than at any point in the game, but could not get a second.